I’ve recently made several audio synthesizer / noise generating boxes. 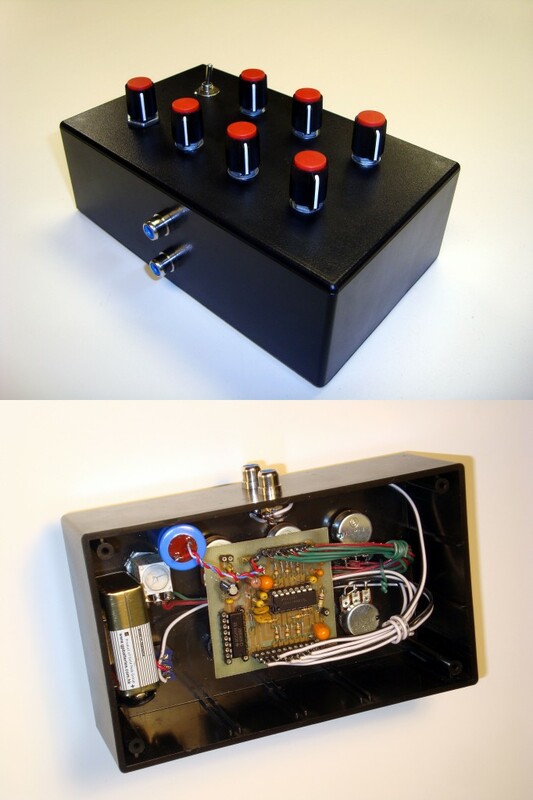 The most recent is the Cacophonator, whose circuit description and board layout are easy to find on the web. Thanks to Adam for showing me how to etch my own circuit boards – something I can now do quite easily at the Makerspace. I modified the board layout, drawn in DipTrace, so I could add SIP sockets and pin headers to tidy up the inside of the project box. The sockets also allow the board to be easily removed, despite the 20 wires running between the board and other components inside the project box. The photos below were taken before I modified the circuit by adding a momentary power switch to slowly recharge the giant power supply capacitor if held for a few seconds. I also added a LM317 adjustable voltage regulator so the power supply voltage can be reduced all the way down to 1 V DC and below. The sonic complexity of this circuit is surprising considering its small part count, and lowering the power supply voltage further adds to the chaotic behavior of the cacophonator. Careful inspection of the board will show additional components not associated with the original cacophonator, but are discussed on electro-music.com. These are used for inputting audio signals (music, for example), which come out the RCA jack quite cacophonated. This entry was posted in audio, electronics, music. Bookmark the permalink.